w-^ The Jewish "^ ? week, where the 23rd conference of the Organization of African Unity was held. Arafat was an official observer at the meeting. PLO Offices Befuddle State Dep't. of the Palestine Liberation Organization. Middle East. "We have strong reservations we'd like to discuss with members." Jewish voters are unlikely to forget. ter if it moves in concurrence with the Administration." Frank Lautenberg(D., N.J.) and Howard Metzenbaum (D., Ohio) has 43 signers. last November remain in effect. fend the "Third World crowd"
of pandering to the Jews,"
'ECIAL^fc^4 ^\PJ" 60 of 174 room. "America 's Most Affordable Spa "
cancer in the Sharett Institute. Center is the brain child of Dr.
members of Temple Beth El. impact on the social sciences. Adolescent Cancer Center in Hadassah; Dr.
members of the Temple Beth El congregation. Quite the contrary. To the likes of Lt. Col.
upon them especially North's "bravery"
euphemism when it declaimed upon Mr.
word in the extreme rightwing for "Jew." or Ohio Rep. Bob McEwen. Pity our democracy. Pity our Constitution. tions of the city of Jerusalem,"
the letter initiated by Reps.
letter was a copy of the Dec.
rank has ever visited Israel." SUBSCWPTKJH RATES Local A,.. Annual Vaar Minimum $7). SPD's history, spirit and soul. he died early in 1967.
life to work undercover against the Nazis. character with his political life. issue, why, then, all the fuss? shul is not a legitimate facility. to remove it from the agenda,"
ty of able and smart people cent" of Jews. 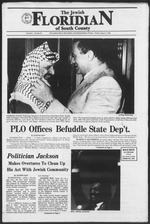 To Close Down PLO Offices in U.S.
Secretary of State Douglas J.
Bennet, Jr. wrote to Re'p. migrant Visas Sec. 107 (2): "c"
days, membership and religious school. the employ of the PLO. ment rights of free speech? usual in the United States. PLO. For example, the U.S.
and lacking in due process? rorist activities of the PLO. 'K.Hi* .Hi |* r |H f~.ll iliiiihl. ik t Hii.lil, . was Mayor from 1957 to 1966.
who led the Federal Republic. SPD in joint harness in Bonn. speak his mind (or write it). shaped their identity as Jews. Jewish values to their children. ty as women and as Jews,"
ockpiles to Iran without U.S. Scheduled to begin here Oct.
S. approval for the sales. >rove the resale of weapons. >ut of money and/or property. their attorneys that the U.S.
ity communities for over 35 years. add The Court, to your portfolio. of the book must be stopped. criminals copies of 1,500 files. a summary of the "Protocols"
Academy Yeshiva University High School for Boys. Volunteer League's Distinguished American Lecture Series. at 8:15 p.m. Friday, Aug. 21. Aug. 15 will begin at 10 a.m.
Temple Sinai of Delray Beach. L'Anjou to follow on Aug. 20. Gaon in "Kazablan." On Oct.
24, "Lies My Father Told Me"
p.m. All seats are reserved. Sacks begin at 7:30 a.m.
483-0770 or Flo at 482-1892.
son can be reserved now. each other or to arson. the extent of the damage." was discovered at 12:30 p.m.
open from 8:30 a.m. to 6 p.m.
and August 2 from 8:30 a.m.
pear on their FAU transcripts. to an FAU degree program. at 5 p.m. Sabbath and Festival Services 8:30 a.m.
day evening at 8:15 p.m., Saturday morning at 9:30 a.m.
1401 N.W. 4th Ave., Boca Raton, Florida 33432. Conservative. Mailing Address: P.O. Box 2262, Boca Raton, Fla. 33427-2262.
information regarding services call 483-5384 or 394-5071.
programs, call 482-0206 or 482-7156.
shman. Sabbath Services: Friday at 8 p.m., Saturday at 8:30 a.m.
Daily services 8:30 a.m. and 5 p.m.
333 S.W. Fourth Avenue, Boca Raton, Florida 33432. Reform. month, Saturday morning services 10:30 a.m.
servative. Located in Century Village, Boca. Daily Services 8 a.m.
and 5 p.m. Saturday 8:45 a.m. and 5:15 p.m., Sunday 8:30 a.m.
Cantor. Sabbath Services: Friday at 8 p.m., Saturday at 8:45 a.m.
Daily Minyans at 8:45 a.m. and 5 p.m.
phone 276-6161. Cantor Elaine Shapiro. critical in defeating, by B2 to 53.
religious parties, one of them. the Likud bloc, led by Mr. Shamir. In an unexpected move. Mr.
urging members to reject the bills. attitudes about the Middle East. remember your phone. And this number.